A brisk wind whipped around NYPD barricades in front of Trump Tower on a mid-November evening. Outside of the building, a group of immigrants’ rights activists from across New York City set up shop to rally for the passage of a clean DREAM Act and more comprehensive immigration reform. Speakers representing organizations that work with communities from backgrounds ranging from Central America to the Middle East took the podium in sequence. They exhorted Trump, to hear the testimonies and demands of the minorities he derides and attacks. Among this group of activists stood two people in royal blue shirts who were there to speak about Nepali immigrants who hold TPS. TPS (Temporary Protected Status) is an immigration protection given to Nepalis, and it is one that is at serious risk of being snatched away by the Trump administration this month. Starting in 2003, the Department of Homeland Security Secretary has been responsible for deciding which countries’ nationals should qualify for TPS relief, and which countries will lose the status. Since the Trump administration took office, DHS has terminated TPS for Sudan, Nicaragua, El Salvador, and Haiti. The beneficiaries from the remaining countries are understandably apprehensive that their home country will be the next to be eliminated from the program. On April 25th, 2015 a 7.8 magnitude earthquake struck Nepal near its capital Kathmandu. The damage was devastating, and the estimated death toll neared 9,000 people. Thousands of Nepalis’ homes and livelihoods were destroyed, and a long period of further environmental shocks and political instability followed the disaster. Nepal was granted TPS in June 2015 due to these conditions. It is the only Asian country to be currently designated as a TPS beneficiary. 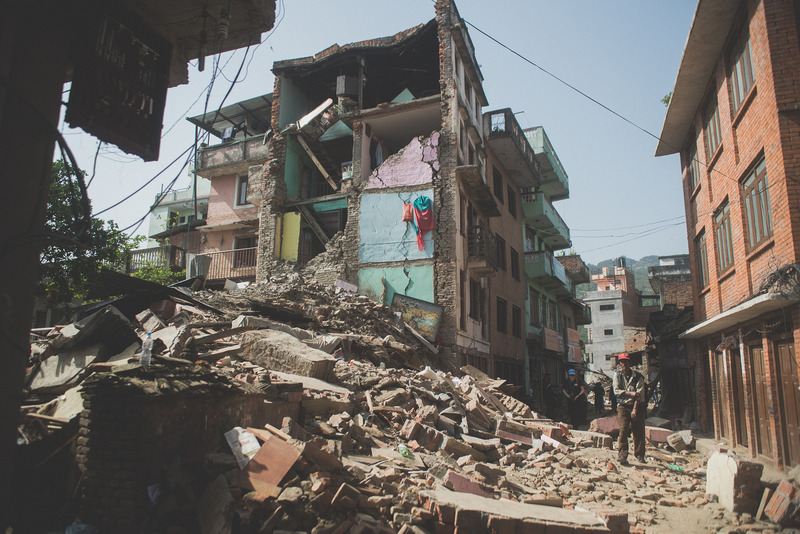 The 2015 earthquake devastated Nepal. Image via Flickr. The earthquake hit close to home for Rabin, even though he was thousands of miles away. Rabin, who stood before a supportive crowd on that day in mid-November in his blue shirt and told his story, is a TPS recipient. He and his wife came to the US for her medical treatment well before the quake struck. After it hit, they were stranded. “Everyone in my family was in shock. The country was in chaos. I couldn’t go back home, and it was more helpful for me to be here to help to support Nepal’s recovery,” he recalled. With TPS, he could get a work permit, health insurance, and open a bank account. Without TPS, he would have either had to return to a struggling Nepal with his ill wife, or taken the risk of living undocumented. As of October 2017, 14,791 Nepalis received TPS. That may seem like a relatively small number in comparison to , for example, the roughly 800,000 DACA recipients made vulnerable by Trump’s assault on the program. But according to US Census Bureau data, the number of Nepali TPS holders constitutes almost 10% of the entire Nepali population in the country. When you think about proportions, it becomes clear that TPS is an important shaper of Nepalis’ lives in the US. Yet, the issue of thousands of Nepalis’ struggle to remain here in the face of an increasingly cruel immigration enforcement machine has gone largely under the radar, even in media focused on South Asian Americans’ experiences. There may not be nearly as many Nepali immigrants in the US as those from larger countries like India and Pakistan, but their population is growing rapidly. According to the Pew Research Center, between 2000 and 2015, the estimated population of Nepalis in the US grew from 9,000 to 140,000. Moreover, especially in comparison to other South Asian immigrant groups, many Nepalis are living in poverty. Pew Research Center data claimed 23.9% of Nepalis in the US lived in poverty as of 2015; the data on Indians, Pakistanis, Bangladeshis and Sri Lankans in the same year showed the percentage of the population living in poverty was 7.5%, 15.8%, 24.2% and 8.7%, respectively. So, the Nepali community contains both a large number of immigrants who are relatively new to the US and large number who are working-class and poor. These immigrants’ experiences likely don’t hew to the already-extremely-tired-out “model minority” narrative prominent amongst more materially and socially privileged South Asians. Yet stories like Ravi Kumar’s are just as worth telling as “canonical” narratives of South Asian immigration to the US, and they are in need of a space to be told and be heard. Adhikaar members celebrate graduating from English for Empowerment classes. Image via Facebook. Rabin found his space at an organization called Adhikaar, the name of which was emblazoned on his blue T-shirt that day in November. 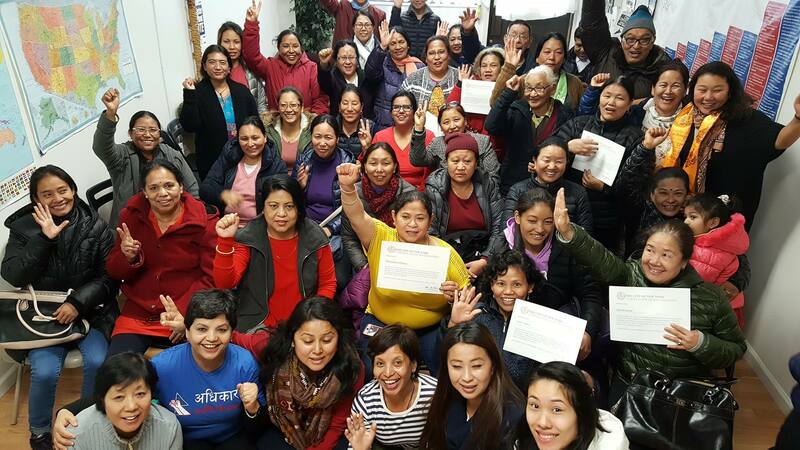 Adhikaar was founded in 2005 by four Nepali women who wanted to address the lack of culturally competent services and assistance for Nepali-speakers in need in New York City, which is home to large Nepali community. Since its creation, Adhikaar has been a strong mobilizer of low-wage workers like domestic workers and nail salon employees, and it has provided services like helping people access healthcare. It has also been at the forefront of advancing research into the Nepali community’s diverse experiences of settling in NYC and what issues they face. However, as Adhikaar’s executive director, Pabitra Khati Benjamin, told Kajal, political action around immigration issues was not a focal point of Adhikaar’s work. The possibility of Nepal losing TPS changed that. Now, Adhikaar is throwing itself enthusiastically and determinedly into immigrant rights activism, and it’s been a wild ride into a world of bureaucratic arguments, civil disobedience, racial solidarity and community development, with an uncertain end in sight. Part 2 explores the work Adhikaar has been engaged in to fight for TPS renewal and legislative solutions to the precarity TPS holders live with.